Buy The Dip - What Does It Mean? What does it mean to "buy the dip"? 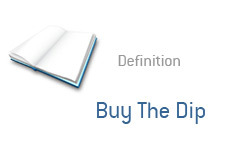 What is the definition of "buying on the dips"? "Buy the dip" means pretty much exactly as it sounds. If you "buy the dip", this means that you are planning on using weakness in a stock (or any asset for that matter) to lower your average price in a position. If you "buy the dip", then you are of the opinion that any weakness is just temporary, and that the asset (for simplicity's sake, let's say a stock) is going to move higher. This idea is best illustrated through an example. Example. The markets are currently very volatile. You hold a sizable position in GOOG. GOOG is struggling and is down nearly 15% from the price at which you bought it. You believe that this weakness is just temporary, and that GOOG (Google) will eventually soar to greater heights. You decide that you are going to "buy the dips" and purchase more Google shares every time that it drops a certain amount. This will increase the size of your position in the company, but also drop your overall average cost in the position. The danger of "buying the dip" is easily seen - what happens if the position doesn't turn upwards? Do you keep buying all the way down? Many people have gone broke "buying the dips", and you should always be careful when doing so.